I have always wanted to have a Carene, since the very first moment that I saw it online on ebay from lewertoski in the Deluxe or Tobacco versions. I was fascinated by its line and design, even though already possessing many dark pens, I was braked by the color and even more I did not know anything about nib performance. Moreover it was always expensive. When, after several Waterman, I realized that the nib I wanted was Fine, I looked for it paying attention to the price. So I found an auction without any bidders on lewertoski and for “few” euros I won a new model, very beautiful in its coloring. As always lewertoski was fast even though I could not pay him immediatly because the system was messed up with multiple purchases and shipping costs. The pen arrived accompanied by a Waterman classic elegant hard cardboard blue box, with a converter included in the pen and a box of long cartridges Waterman Florida Blue; there were also two leaflets for warranty and for the Carene Islands line. Everything had an elegant but, at the same time, young and fresh look. The pen, in its metallic aquamarine green color, takes the name of Islands Lagon with one “o” and for its chromed details is a ST. 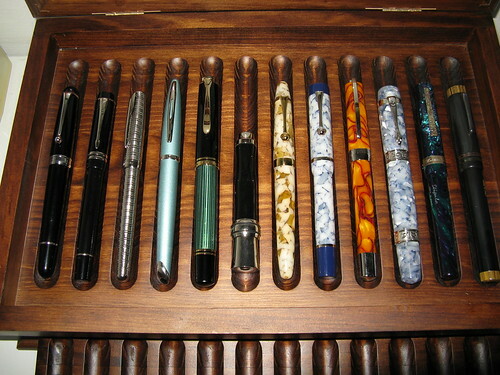 The pen is very well defined in its structure and finishing, having a solid matter too. The line is continuous, without interruptions or imperfections of any kind and is much better than how it appeared in photos except for the handle that as all shiny handles tends to show dirt and fingerprints. Overall, the pen is very well done. The materials that make up this pen are metal and plastic. The handle, the feed and the internal structure of cap and body cylinders are in plastic. The clip, the trims and all the thin metallic coating that covers the cap and pen body are in metal. The design is a cigar-shaped, with acute ends, and draws the hull shape of a ship, from which its name. The clip is very stiff and slightly curved and follows flat for almost the entire length of the cap. The design reflects what I expected although once the body is screwed to the handle, the nib is not aligned with the rear of the pen. The pen has standard size, at least for my small hand. Its dimensions are: 150 mm closed, 80 mm body, 65 mm cap, 128 mm uncapped, and 148mm posted and diameters are for the cap 10.5 mm in the wider part that is the area of screwing, and body 12 mm. The pen is enough heavy (gr. 32) also if it is dry and without converter but is very well balanced even when uncapped and doesn’t tire the hand for long time of writing. The nib of this pen is one of the distinguishing features, perhaps the principal, and let immediately turn the eyes of those persons around us. In this case the magnitude follows the body profile and has shape of a bow; whereas the profile I can say that its extension in the upper deck 2D is 2 x 0.9 cm. The line is fine, really, neither too thin nor too large, even compared with other already owned. The nib is hard and runs well although not as others. In any case I am very satisfied and the flow is constant with any ink or paper, while not abundant, but medium so that it dries 1 second after writing. The peculiarity of this nib is that the feed is separated as the air system, that has the hole away from the nib at the bottom of the plastic section. It might seem an armored nib as the one on Parker 45 but it is a completely outer nib glued to the plastic feed system. This obviously means that the nib is not removable, at least not by the medium user. I am very pleased with this nib so much so that the pen still remains one of my favorites to write on any paper. The pen has a cartridge/converter system and comes with a Waterman deluxe converter and 1 box of Florida Blue cartridges. Although it seems it can mount Pelikan cartridges I do not recommend using it because of the fact that the Waterman feed is different from Pelikan one and that there may be loss of ink or in the worst cases, it breaks the feed. I suggest the use of converter if you use the pen in the office or at home because the bottle ink is cheaper 3 times less than cartridges. Traveling cartridges are obviously more practical remembering that in the airplane it is better to have the pen without cartridges and clean because of the air pressure that would leave the ink. The peculiarity of this pen charging system is the presence of 2 rubber rings for tightness in the area of screwing between grip and body, perhaps to prevent any leakage of ink when you travel. The pen was bought on ebay from lewertoski (Pensellerfromfrance) on March 3rd, 2007 and it was paid € 77.00 plus shipping cost of € 8.00. The list price was of € 178.00. Being a high-end pen, as with all of the same class Waterman pens, it has a life warranty. Of course like all the lewertoski pens also this pen was brand new. After some months I can say that the pen value is certainly the money I spent. In my collection is one of my favorites and not only for the value but also for the rest. At the date of this test, based on the purchase price, the Carene is at the eighth position from the most expensive piece of my collection. Overall I was fine with lewertoski and I recommend him to others. This is my first pen review, and now that I have reached the end I’m finding difficulties to avoid repeating the same things of other sections but there are people who do not have time and desire to read everything and read only the conclusions, as often I do too. It’s obviously impossible to give an assessment of each pen comparing it with other pens but relating to the best or the worst score, I consider only my experience with this pen that belongs to the high-average class both in the commercial pens market and in my private collection. The pen is available in several versions with names that change not only for the color but also for the set (Deluxe or Standard). But all of them should have the same physical features, at least for those with the fine nib. Surely it is a pen that I was very satisfied of and I would recommend it to others.